Metric & Calibre are a pair of typefaces that share a fundamental geometry yet differ in the finish of key letterforms. Metric is a geometric humanist, sired by West Berlin street signs. Calibre is a geometric neo-grotesque, inspired by the rationality of Aldo Novarese’s seldom seen Recta. They were conceived as a pair but function independently of each other. The development of Metric & Calibre is based upon two ideas—1: “engineered geometry” and its application to street signage, 2: alternate letterforms in typefaces. Geometry implies a certain amount of rationality and rigidity, two things that are difficult to reconcile with letterforms. Early attempts like Bayer’s Universal Alphabet are fascinating, but ultimately flawed as usable, working typefaces. One of the most successful in this genre is the seminal Futura designed by Paul Renner in the early 20th century. It is a triumph of rationalism and control over the arbitrary shapes of letterforms. 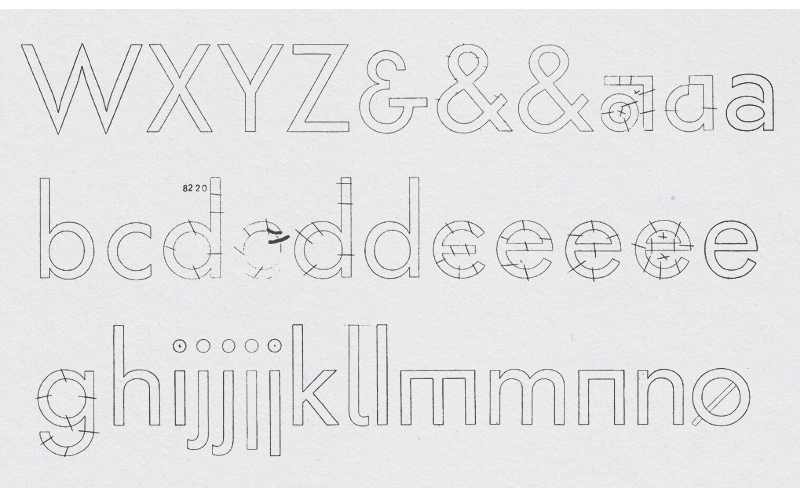 Typeface designers apply geometry differently than engineers—trained in the subtleties of letterform construction, sensitive to positive and negative space and optical correction. Engineers are unfettered by such matters. To them, a circle is a circle and a capital O can be adequately drawn as such. Stroke weights are uniform and overshoots are irrelevant. Street signs are a common place to find ‘engineered’ typefaces, and have provided much inspiration to typeface designers. The best-known are FF DIN by Albert Jan-Pool and Interstate by Tobias Frere-Jones. FF DIN is inspired by the letterforms in the Deutsches Institut für Normung 1451 specification, and Interstate by the Federal Highway Administration (FHWA) Standard Alphabets For Traffic Control Devices. The enduring popularity of these classics is testament to the appeal of ‘crude’ letterforms to designers, proof that typefaces can successfully originate from outside the canon of book-centric history. Street sign guidelines are effectively mini-corporate identity manuals. They contain (very strict) rules for typefaces, colours and layout. They appear to be designed by, and for, engineers—measured and described exhaustively, leaving no room for error. The resulting typefaces are suitably rigid, crude in their construction but charming in spite of it. I first saw the West Berlin Signs in 2010. In stark contrast to street signs I was accustomed to, the letterforms struck me with their elegance and clarity. The geometry intrigued me, allowing the letters to stretch and condense to accommodate various lengths of street names. The o looked like a perfect oval, b d p q felt like a practical joining of the o and a stroke, t is a simple cross, ß is beautifully sharp and the stroke weight is ideal, functionally monoline. However, I was most intrigued by the a. Using an oval for the bowl is a delicate solution, harmonising with the rest of the letters and contrasting nicely with its vertical terminal. 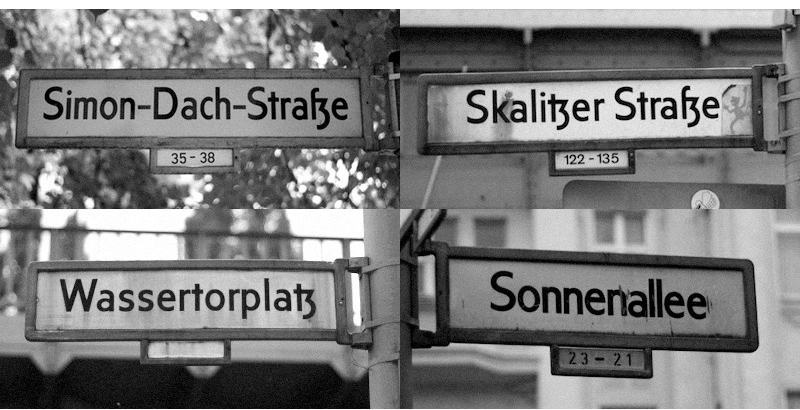 Update: After speaking about these street signs at TYPO Berlin in May 2011 I was approached by Andreas Frohloff. In the mid-90’s he designed a digital version of the street sign typeface which is slowly replacing the old. He has a photocopy of the original template, shown above. Metric is an attempt to temper the geometric tendencies of the engineer by the hand of the typeface designer. The letterforms in Metric & Calibre are, of course, optically corrected. I’ve tried to keep it as subtle as possible, I wanted letterforms that felt monoline, rational and unpretentious. Like the street sign letterforms that informed the development but without the shortcomings inherent to strict geometry. The release of Helvetica and Univers spurred many type foundries into action. All of a sudden everyone had to have their own neo-grotesque—Berthold even revisited Akzidenz Grotesk and released AG Buch. 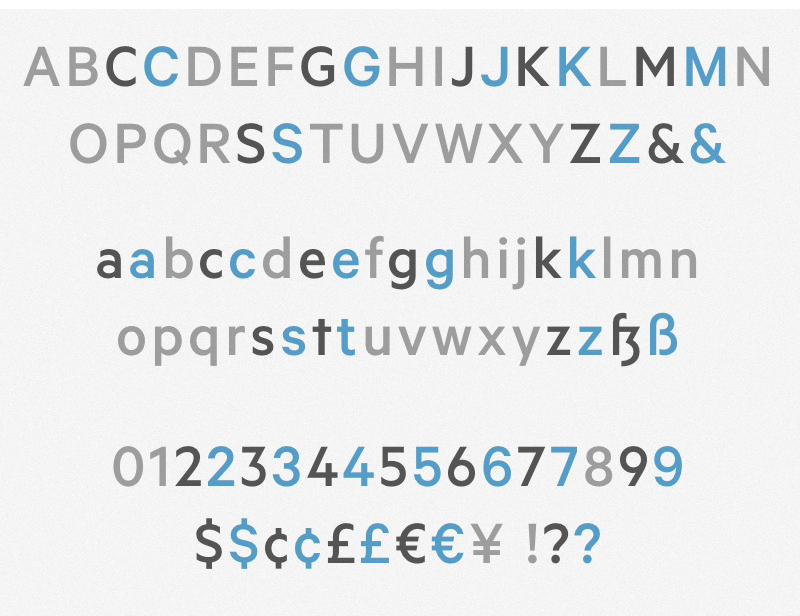 The now-defunct Nebiolo foundry released Recta in the late ’50s, designed by a team lead by Aldo Novarese. Like Novarese’s Microgramma & Forma, Recta seems to be an attempt to rationalise the genre. Unfortunately it’s marred by over optical correction and awkward branching—neither smooth nor sharp. However, Recta’s rationalisation of the neo-grotesque genre appealed to me and was a logical starting point for Calibre. Many typefaces are released with alternate letterforms. It’s not a new idea by any means, and these days it seems almost compulsory to include several. Stylistic alternates are the most common, typically a g y ‘schoolbook’ glyphs. Alternates can dramatically change the tone and flavour of a typeface, not only in a single word but also across a block of text. It’s common practice for typeface designers to test several alternate letterforms during the development process. Like a good editor weeding out weak sentences, most alternates are eliminated to create a stronger overall typeface. The unorthodox alternates of Futura are well known and documented. What I find interesting are the lesser known, more ‘humanist’ versions. Above is an example of Futura with recreated ‘humanist’ alternates. It demonstrates how a few small changes can create a striking difference to the tone of the typeface and what we understand to be ‘Futura’. It steps out of one genre and into another—changing from a strict geometric typeface to a warmer, more humanist one. Several stylistic factors are usually at play within serif typefaces: terminals, stroke variation, stress and the shape of the serifs themselves. There are many serif typefaces with alternate letterforms, but they’re typically ‘schoolbook’ and have to remain firmly within the established genre. A core set of Garalde letterforms with Modern alternates would likely be a terrible idea. Unlike serifs, many letterforms in a sanserif are ‘pan-genre’. It is due to the shapes of a few key letterforms to establish the specific genre of the sanserif. During the development of National in 2006 I created grotesque, neo-grotesque and humanist alternates—attempting to give three different textures to the overall flavour. It was an interesting, but ultimately failed experiment—the core letterforms of National were too idiosyncratic to work with a variety of alternate genre-glyphs. The concept stayed with me and now manifests in Metric & Calibre. Ironically, I find that typographic alternates often remain unused. To this end, Metric & Calibre are fully independent OpenType font families. Though they are linked in lineage, it was more pratical that they become two different typefaces. Metric was the first of the two typefaces. Born of geometry and rationality it functions competently on its own. It shares many things with Calibre: it’s underlying geometry, several core letterforms and the range of weights and styles. Calibre takes these things and adds letterforms from a separate genre, defined by such classics as Recta. Metric & Calibre are fully independent typeface families, starting from a similar line but finishing in very different places. They are therefore sold separately, but generously discounted if licensed together. Metric is available in seven feature-rich weights in Roman and Italic.